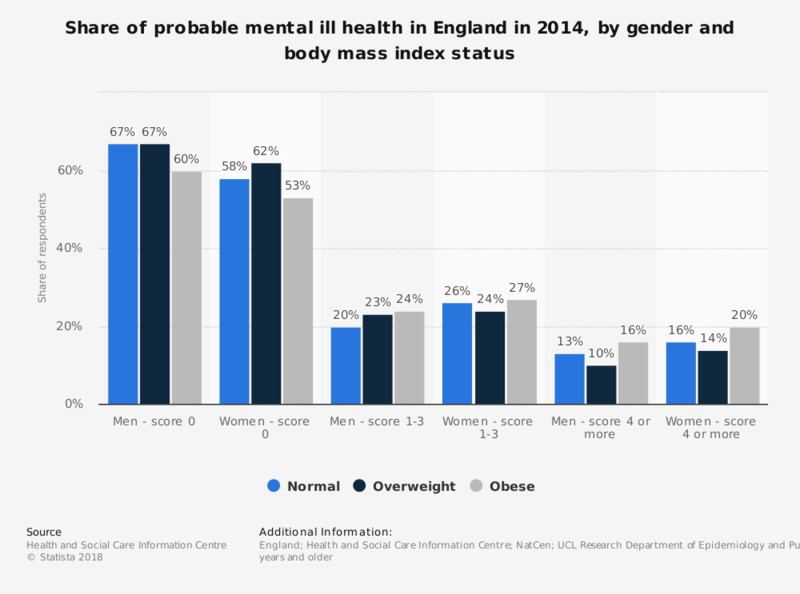 This statistic displays the probable mental ill health of individuals as measured by the general health questionnaire, in England, by gender and body mass index in 2014. In this year, 26 percent of women with a score of 1-3 (less than optimal mental ill health) had a normal body mass index. "- score 0 indicates no evidence of probable mental ill health. - score 1 to 3 indicates less than optimal mental ill health. - a score of 4 or more is referred to as a 'high GHQ-12 score', indicating probable psychological disturbance or mental ill health." "- normal weight: 18.5 to less than 25 kilograms per square meter". - overweight: 25 to less than 30 kilograms per square meter. - obese, including morbidly obese: 30 kilograms per square meter or more."